Rutabagas are in the Brassica family (Brassica napus) so this tells us they are a cool season crop like others in their family (cabbage, cauliflower, broccoli). In the South, we are lucky enough to be able to grow these vegetables as a fall crop. Rutabagas resemble overgrown turnips. Their roots, which are what you eat, will grow much larger than turnips, without becoming woody, as turnips often do. However, they are much tenderer if you harvest them when the roots are less than five inches wide. 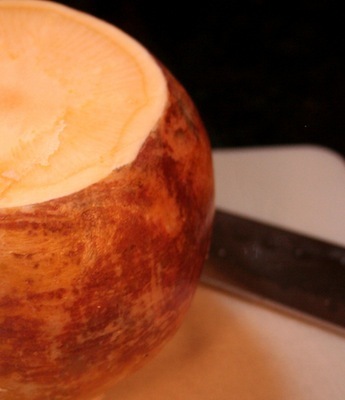 While turnip flesh is distinctly white when cooked, rutabagas are very yellow. Rutabagas are also more mildly flavored than turnips. If you have someone in your family, like my husband, who cuts turnips with potatoes, they won’t need to soften the flavor of the rutabaga. It also blends well with other flavors, like the bacon in Chef Linda’s Rutabaga recipe. Choose a site to raise your rutabaga crop that gets at least six hours of sun. The soil should be slightly alkaline. In most areas with clay soil, this will probably mean you need to incorporate some lime into the planting bed several weeks before you sow the seeds. When you are ready to plant, work in some good compost, which will act as organic fertilizer for the newly emerged seedlings. In snow country, sow the rutabaga seeds outdoors after all danger of frost has passed. In Southern climes, sow the seeds about 3 months before the first fall frost is predicted. Most seeds are sown at four times their size, and rutabaga seeds are no exception. Once the seedlings are up, which takes about two weeks, thin them so that there is eight inches between each plant to allow room for the root bulbs to expand. Use a balanced fertilizer when the plants reach about half a foot tall. Granular fertilizers should be sprinkled on the side of the row and worked into the soil. These should not touch the plants or roots. Water them in well. Spray liquid fertilizers directly on the leaves of the plants according to package directions. At this time, you can also top-dress the row with more good compost. Rutabagas dislike hot weather. Keep the plants watered when the weather does not cooperate. Mulch the rows thickly with straw or marsh hay after the plants have appeared. This will keep down weeds and hold moisture in the soil. You can leave the fall crops in the soil until the ground freezes. They should come out and be stored in a cool place before a heavy freeze. If you haven’t tried rutabagas, give them a grow. They are easy. Some people even eat the leaves in salads or cooked as a winter green.